As I started to write about highway US-4, I noticed that President Trump declared last week as “Made in America Week” at the White House. So I took up that theme and here are some products made along US-4 in 1962. Highway US-4 does not cross any of Roadtrip-'62’ ™ full-length, virtual roadtrips. Instead, US-4 is another short route, running through only 253 miles through Vermont, New Hampshire, and New York. Beginning in Portsmouth, New Hampshire, the route has started at Portsmouth Circle since probably 1956...at least officially. Strangely, actual signage at the at that point suggests a couple of other endpoints, traveling part of the Spaulding Turnpike to the I-95 freeway. In Vermont and New Hampshire, the route is signed east–west, which is standard for even-numbered US-numbered routes, but New York signs it north-south because it physically travels that direction there. In Concord, New Hampshire, we find a longtime manufacturer of some commercial kitchen equipment that we seldom consider: the deep fryer. But if you’ve ever had french fries, fish fillets, chicken, or mozzarella sticks at a fast-food restaurant, even back in 1962, they may have been fried in a Pitco Frialator. Somewhere back in history, someone discovered that the deeper the frying pan, the better the frying, and eventually the deep fryer became a standard piece of kitchen equipment. Pitco has been making these since 1918, when they introduced an innovation that allowed food particles to fall below the heating element into a cooler zone. This meant that the bits did not overcook, scorch, or burn, keeping the flavor of the frying food free of burns and other unwanted tastes. Pitco produces a complete line of commercial frying equipment for all our favorite roadtrip foods, including floor fryers, countertop fryers, donut fryers (yum-yum! ), and even pasta cookers. Concord is also home to Duncraft, since 1952 a manufacturer of products for backyard bird feeding. Even then, it was one of the largest hobbies in America. The owner, Gil Dunn started with a design called the Flight Deck Windowsill Feeding Station, which combined offerings of birdseed, water, and even peanut butter for backyard birds. He began with just a small tear-out ad in the New Yorker magazine and by the 1960’s Duncraft published a 16-page, black-and-white, mail-order catalog. There are now over 500 bird feeding products made by Duncraft in Concord and nearby Penacook, New Hampshire. The company is still owned and operated by the same family. As we leave Concord, we cross US-202, which I wrote about previously. At Lebanon, New Hampshire, we would have found H.W. Carter & Sons back in 1962, though they are gone today. The company, established in 1859, made clothing here and employed more than 175 people at its peak operation in the 1920s. Carter was known for sturdy clothing such as dungarees, overalls, hunting gear, ski jackets, industrial aprons, and lab coats. Some time after 1890, they acquired another New Hampshire clothing manufacture and continued under the trademark of “Carter’s Watch the Wear”. The business was family-run for more than a century, first by Carters and then by the Jackson family. But in 1967 the company was sold to outside investors who moved operations south where labor was cheaper. The Lebanon factory manufactured its last pair of overalls on in 1985. Other than H.W. Carter & Sons, Lebanon’s industries included furniture mills, a leather tannery, machine shops, and a woolen textile mill. The industrial district was in decline from the 1950s and 1960s, with a major fire in 1964 that destroyed a large portion of the district. But the Carter factory was spared and the AVA Gallery and Art Center acquired the building in 2003. It now houses studios for local artists, art classroom, and gallery space. It’s also full of artifacts from H.W. Carter & Sons past. In 2012, a pair of entrepreneurs revived the Carter brand, for awhile selling chore coats, shirts, aprons, work trousers, and other clothing based on original designs at J. Crew, online, and in other stores. But they seem to be gone now so we can no longer buy Carter clothing. At West Lebanon, we cross the Connecticut River into Vermont. We saw the headwaters of the river in my article about US-3, which began near them. This area has several scenic rivers, as they make their way down from mountains to the Atlantic Ocean, which in only a couple hundred miles away. So even though I’m focusing on Made in America today, we have to do some sight-seeing as we travel US-4. One of the most scenic spots in this part of Vermont is the Quechee Gorge. The gorge was formed by glaciers and their meltwater approximately 13,000 years ago. 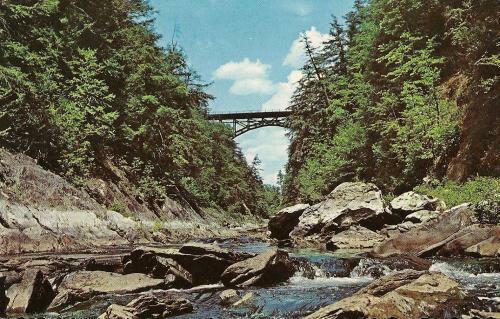 Highway US-4 crosses the gorge on a scenic steel arch bridge and provides good views down to the Ottauquechee River, which has carved the gorge. Below on the river, with good views backwards up the 165-foot-deep gorge to the bridge, is Quechee State Park. The land for the state park was originally the site of the A. G. Dewey Company, a major wool processor in the 19th century and up to 1952. The mill closed that year and the buildings were demolished. Almost immediately after the mill closed, the US Army Corps of Engineers began taking land in the area for a flood control plan. The North Hartland Dam and the reservoir at the park are the result. Construction of the state park campground and picnic areas began in 1962, so we probably could not have used them during that year. Today there is also hiking up Quechee Gorge. Marble lamp purchased at Proctor, Vermont. Our next point of interest is at Proctor, Vermont, just a few miles north of US-4. Proctor is the site of the Vermont Marble Museum, and also formerly of the Vermont Marble Company. Vermont Marble had a large quarry here, and blocks of their marble still dot the museum site. When I visited in 1976, and likely back in 1962, you could see some of the quarry's operations around the adjacent buildings. The quarry itself appears to have been underground, as is another in Danby, Vermont. The museum of course highlights the Vermont Marble Company, which supplied marble for the Jefferson Memorial, the US Supreme Court Building, and hundreds of other monuments and buildings worldwide. They are no longer in business. The display of various colors of marble from around the world was my favorite part at the museum, which is still open. Nice gift shop too; above is a photo of a lamp I bought there. We’ll wrap up today’s trip at Troy, New York, home of the Troy-Bilt Rototiller and other gardening products. In 1937, C.W. Kelsey created the first American-made, rear-tine, rototiller, which he based on a German machine known as the Earth Grinder. He designed his rototiller to be suitable for the rocky American soil he was used to, with rear power-driven wheels. The company, which was originally named Rototiller, Inc., was sold to its chief engineer, George Done, in 1963. In 1962, Done had designed a heavier and more powerful Trojan Horse model. An electric starter was added a few years later. Eventually, Troy-Bilt was purchased by MTD Products, who had also purchased Sehl Engineering Ltd. of Canada in 1962. Today, Troy-Bilt manufactures tractors, mowers, tillers, cultivators, trimmers and a variety of outdoor power tools, but up until 1968 they made only rototillers. And the MTD Company includes many other long-time popular brands including Cub Cadet, Yard-Man, White Outdoor, Yard Machines, and Bolens. The company headquarters moved to the Cleveland, Ohio area and production ended here in Troy long ago. 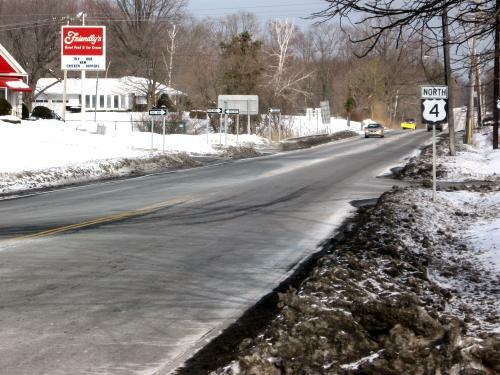 Highway US-4 continues another 11 miles south to end in East Greenbush, New York, at US-9. I’m sure we’ll take a look at something fun along US-9 someday here on Roadtrip-'62’ ™, so stick around!